The story of the Firebird goes back to the folk tale of old Russia. Some say that the Firebird flies down from the Tsar’s castle and eats his golden apples; the Tsar’s three sons try to catch the bird, but find only a feather ’ but it glows in the night, illuminating the castle room and lightening their hearts. 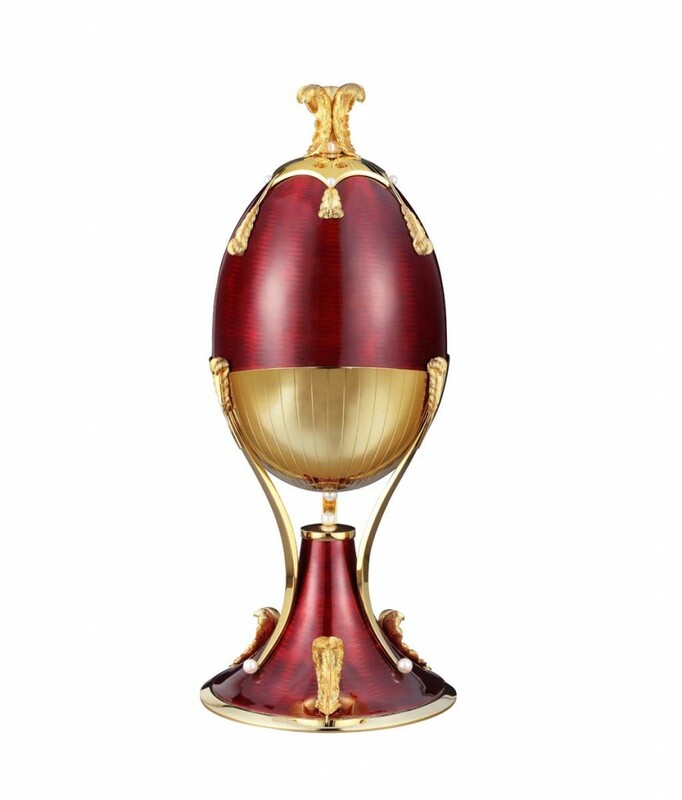 Theo Fabergé’s Firebird Passion is created in sterling silver, 24-carat gold and guilloché enamelled in rich red, the enamelling process exactly as beloved by Theo’s grandfather Carl Fabergé. The finial and surrounding ornamentation mimic the fabled feather, the same motif being employed to support the Egg atop its pedestal. Theo’s fancy takes him to another variant of the myth, which says that as the Firebird flies his eyes sparkle and pearls, descending from his beak, fall into the hands of serfs who are thus able to make their way in life. 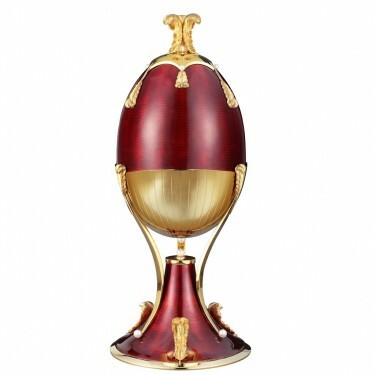 The Egg and pedestal are ornamented with exquisite cultured full pearls. 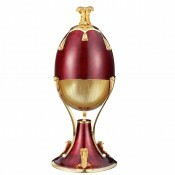 Open the Egg, and in the tradition of the Fabergé family behold the surprise within. 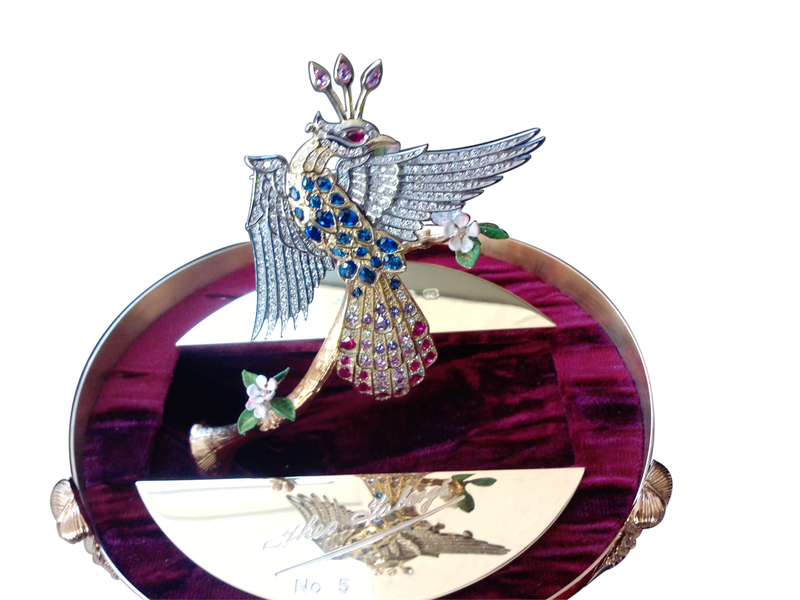 The Firebird, hand-crafted, stands on the apple-tree branch created in sterling silver and 24-carat gold, its blossom hand-decorated and set with diamonds. The Firebird’s magnificent plumage descends in luxuriant swathes over the branches. His tail and body are crafted in yellow 18-carat gold set with rare red sapphires and offset with differing shades of blue sapphire. 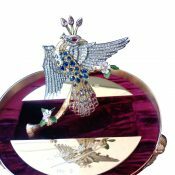 The bird’s wings bear carat-weights of full-cut white diamonds, and his eyes and crest are cleverly rendered in precious red and pink sapphire. The Firebird may be removed from the Egg and worn as a brooch. Its tail may be detached and worn as a pendant. The iridescent Firebird is reputed to have magical properties and to act both as saviour and devil, to anyone who catches it. Theo Fabergé’s Firebird Passion further imbues the viewer with wonder at the enduring story, and with pure pleasure at a triumph in design and craftsmanship. Materials: Sterling silver, 18 and 24-carat gold, pearls, diamonds and sapphires.